DALLAS, June 14, 2017, /PRNewswire/ -- It's the world's biggest discovery in weight management: a product so hot, it generated $7.5 million in sales in less than half a day, despite its initial limited availability to select individuals. Le-Vel Brands, LLC, the world leader in human nutritional innovation and the creators of Derma Fusion Technology (DFT) and the Thrive Experience, has introduced what is destined to become one of the best-selling nutritional products of all time: DFT Duo, the company's first product focusing primarily on weight management. The next level of Derma Fusion Technology, DFT Duo offers a dual-application, enhanced formula concentration with significantly greater absorption – a 205 percent concentration increase from Le-Vel's DFT Ultra – along with a higher lipid metabolism rate and innovative left/right technology for balanced duo release. Its 40 percent larger surface area means DFT Duo packs a bigger punch to help you meet your nutritional and weight-management goals. Worn on both the left and right sides of the body, DFT Duo delivers all-day appetite management, nutritional support, and helps increase the metabolism. DFT Duo is intended to be taken as part of a simple three-step system, alongside Thrive Premium Lifestyle Capsules and Thrive Premium Lifestyle Mix. When used as directed, these three easy steps – completed before you even head out the door in the morning – provide additional benefits including energy and joint, lean muscle, mood, digestive, antioxidant and immune support. All Le-Vel products are manufactured using the best ingredients available, along with technologically superior delivery systems to maximize results and fuel the body with the premium-grade nutrition it needs to meet the day's demands head-on. Like all Le-Vel DFT products, DFT Duo comes in several different designs, which gives consumers the opportunity for self-expression while they work toward their health and wellness goals – and inspire others to do the same. "We're excited to be able to offer a product specifically formulated for weight management," say Le-Vel Co-Founders and Co-CEOs Jason Camper and Paul Gravette. "DFT Duo is based on a game-changing formula. If people are going to make permanent lifestyle changes, we know that simplicity is absolutely key, which is why DFT Duo, like all of our DFT products, is incredibly easy to use – and it works. Our DFT products already have a huge following, so we knew the response to DFT Duo would be great, but this product blew past our expectations right out of the starting gate. It's our most successful product launch to date, and it's already changing people's lives in meaningful ways." Le-Vel originally introduced DFT in 2013 as Thrive was first exploding on the direct sales and nutritional supplement scenes. Derma Fusion Technology was a breakthrough in health, wellness, and nutritional support. DFT is a category creator that infuses the skin, or derma, with a premium-grade formula of superior ingredients, and with a delivery rate designed to benefit consumers over an extended period of time. In the few years that have followed, Le-Vel has introduced additional DFT products to its Thrive Plus line: DFT Ultra, an enhanced version of Thrive DFT; and Black Label, which offers mood support, among other unique benefits. 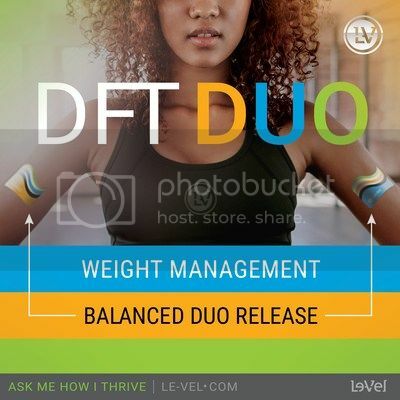 DFT Duo is for anyone who wants to focus primarily on weight and appetite management. Le-Vel recently celebrated an incredible milestone: $1 billion in lifetime orders in less than five years. It's a remarkable achievement for the direct selling industry's only cloud-based, completely virtual company – a cost-effective infrastructure that has enabled Le-Vel to channel its resources into premium-grade raw ingredients, cutting-edge research and technology, and one of the most generous rewards plans in the industry for its independent Brand Promoters. Le-Vel is the recipient of Direct Selling News' Bravo Growth Award in 2016 in recognition for its extraordinary year-over-year growth. The company also was recently named, for the second year in a row, to the DSN Global 100, an exclusive ranking of the top revenue-generating companies in the worldwide direct selling industry. Today, the company has a following of more than 6 million independent Brand Promoters and customers and maintains a presence throughout the United States, the United Kingdom, Canada, Australia, New Zealand and Mexico. May was Le-Vel's highest revenue-generating month in its history, with $50 million in sales. Here's the company we chose to align with 10 months ago... and in the near future my husband CURTIS with be at HOME full-time and a part of the "YouEconomy" with me... that company is Le-Vel. We'd love to show you how!